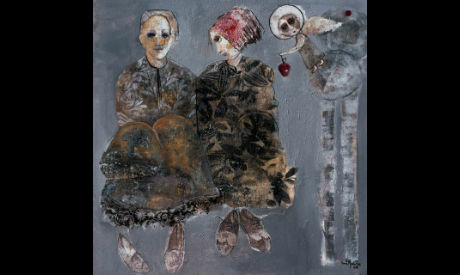 In her new solo exhibition, which opened on 8 January at the Zamalek Art Gallery, Souad Mardam Bey was inspired by a poem from the Syrian poet Mohamed El-Maghoot entitled Adam. The poem rejects the discrimination that exists in the Arab world, with the poet making intelligent use of given names to demonstrate that idea. In her new solo exhibition, Souad Mardam Bey searches for a unity that rises above the religious, gender, social and conceptual divisions created by humankind. The 35 masterpieces in the exhibition took about a year to accomplish and represent the artist's journey from the poem to her psyche and then to the paintings. The message is strong and the themes are creative. The large paintings – no easy task for any artist – use dim colors, so as not to shock viewers with flaming, bright lights. This allows the paintings to slide subtly into the viewer's spirit. The display is testimony to the artist's constant evolution in style, ideas inspiration and messages; her work shows a deep sense of culture and her passion towards her pieces. The painting bearing the name of Adam was the most time-consuming piece to accomplish. Applying many layers of paint and color, Mardam Bey used the features of a regular man, adding a glare to the eyes, which are the painting's source of attraction. The dark coloring is a reference to the material from which Adam was created, while the stern features suggest that he is carrying the burden of Original Sin. 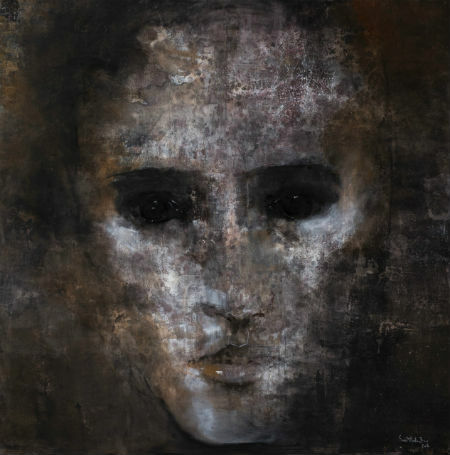 Adam’s penetrating eyes show a hypnotic strength – facing the unknown on earth after leaving Heaven. It is a memorable masterpiece. The rest of the paintings have no titles. Mardam Bey allows the viewers to decode the paintings with their own eyes. We can see the theme of Adam and Eve dealt with in another of the paintings, with an angel enticing them to eat the apple from the Tree of Knowledge. The act of seduction here is not perpetrated by a serpent or a snake. Mardam Bey's idea is that anyone or anything that beautifies wrongdoing would do so in their most attractive form – making an angel the perfect medium. Adam and Eve in Heaven look worry-free, with Eve looking meaningfully at Adam as he simply enjoys the environment. The center-piece of the exhibition shows four persons standing, facing in different directions. One is in profile, while the second shows a face above the shoulder, and the last two are by themselves, not touching. We cannot determine the gender of the four persons, an intentional move by the artist; the message is that we are all humans, we are all the same and yet different and unique. The problems we face in life are similar, and we have more in common than we realize. 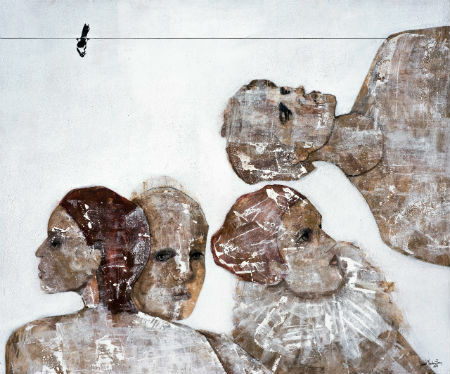 The characters in the paintings have a half-smile as they face life in different directions. There is no fear, joy or confidence in their expressions. The mystery of the gender adds to the beauty of the painting. The brush strokes are confident, showing great talent, expressing the painter’s ideas and message. Mardam Bey also provides her own take on Akhenaten, the king of monotheism, showing him in a new light. The creativity in this painting requires some reflection on the concepts of religion, God and beliefs, which have been dealt with since the beginning of time – since Adam was created. In portraying the one who unified all the gods, the artist maintains the link to the poem. Akhenaten is like another Adam, not attached to any preset religion, but simply looking for the good in life. The crown on his head underscores that he represents the authority and power of the king, while the heart in the corner of the painting sends a blunt message of love. It is a painting filled with hope: Akhenaten unified the gods; hence it should be possible for humans to be unified in support of the more noble values. By adopting the Adam theme, Eve was strongly present in the exhibition. Mardam Bey drew and painted Eve in different stages and situations: from being pregnant, to being seductive, to nurturing birds, all dressed up, with a crown on her head, dating her man and socializing with friends. In these paintings, the artist's philosophy is clear: when there is Adam, there is Eve as well. And as such, Mardam Bey makes a stand against discrimination, unifying the human race in yet another way.